When it comes to linking power politics, religion and climate change, the Rev. Sally Bingham does not hold back. Hanging prominently in the office of her organization, Interfaith Power and Light (IPL), in San Francisco, is a photo of her being arrested at a 2001 protest against drilling in the Arctic National Wildlife Refuge. Kneeling in prayer, she and 21 other demonstrators blocked the doorway to the Department of Energy. In the photo, Bingham stares straight at the camera as a police officer handcuffs her. She later described the moment as a "religious experience." Bingham, an Episcopal priest, is using IPL to evangelize churchgoers to take action on climate change. The Rev. Sally Bingham stands amid newly installed solar panels on the rooftop of one of the churches in her alliance, called Interfaith Power and Light. Photo courtesy of her office. She started with 60 Episcopal churches in California in 2001. Since then, IPL has grown to 14,000 religious communities in 40 states, connected on ways to save energy and reduce emissions. Her ongoing work at particular churches is also getting people in the pews more involved in pushing state and national climate legislation. Along the way, Bingham, 71, has picked up some powerful friends, including Mary Nichols, head of the California Air Resources Board. "She shows up at events wearing her clerical garb, as she's entitled to do," Nichols said. "It has a way of disarming people." 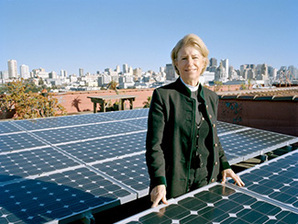 "Her connection to the interfaith community helps create a message that reaches out to more people than just an environmental message would," added California state Sen. Fran Pavley (D), who enlisted Bingham's aid in passing her Assembly Bill 1493, the first U.S. legislation to reduce greenhouse gas emissions in vehicles. Pavley, whose seminal work has led to much of California's pioneering climate change legislation, found herself being converted by Bingham's message: "You always come away sort of inspired -- like you're not working hard enough -- after you talk to her." Although her growing flock sees the priest as a faith leader and an environmental organizer, Bingham was neither of these things for much of her life. Until the late 1980s, her primary role was as a wife and mother of three. Bingham lacked a college degree, enjoyed an affluent lifestyle, and has described herself during that period as "rather frivolous" and "a taker." Her own conversion began 25 years ago with an itch to get involved in bigger issues. She was invited to join the board of a New York-based environmental group, the Environmental Defense Fund. "That's where I started to get a really serious education about climate, about overfishing, about deforestation -- all of the issues that are threatening the planet," Bingham said. "It was in this process that I realized religious leaders should be embracing this issue -- that we can't sit in a pew and profess a love of God and profess love for our neighbors and then trash the Earth." Bingham, a lifelong Episcopalian, wasn't aware of any environmentalist faith leaders at the time, so she decided to fill the niche. At age 45, she began the 10-year process of becoming a priest, ending with her graduation from seminary in 1994. The transition wasn't always easy -- Bingham was no longer married when she became a priest. But when asked about her midlife reinvention, she showed no signs of regret: "I truly believe that this was an invitation from God for me to start making people aware that environmental stewardship is a matter of faith." After her ordination, Bingham immediately began her work as an organizer. She founded Episcopal Power and Light in 1998, the same year California deregulated its energy industry, and negotiated a deal with Green Mountain Energy Co. to help churches switch to the renewable energy provider. But in the wake of California's 2001 energy crisis, Green Mountain abandoned its California operations. The 60 churches that had signed on to Bingham's deal were "disgruntled, to say the least," she wrote in her 2009 book, "Love God, Heal Earth." Bingham also faced some stray voltage from the pews. "I was criticized when I was first preaching for bringing a political issue into the church," she said. Because environmental concerns like climate change can seem distant and abstract to congregations, most faith leaders instead focus on issues of more immediate personal concern, said sociologist Laurel Kearns from Drew University in New Jersey, who studies religion's role in environmental activism. "A lot of folks come to their environmental knowledge separate from the church," Kearns added. "Most of us don't think about the environment in relation to our own personal identities." Bingham decided to broaden and deepen her mission. She extended it to people of all faiths and set out to get individual congregations involved in the nuts and bolts of reducing their own greenhouse gas emissions. There was, she would remind them, a religious connection. "The exciting thing about it was that every mainstream religious tradition has a mandate that we are the stewards of creation," Bingham said. She also stressed the temporal rewards of going green. Lured partly by the prospect of saving on their energy bills, IPL churches found they could lower their carbon footprint by replacing old refrigerators, upgrading air conditioning systems and leasing solar arrays. A Texas synagogue replaced its light bulbs with light-emitting diodes, a Unitarian church in New Mexico installed solar panels on its roof, and hundreds of other churches joined Bingham's movement to become "Cool Congregations." The orthodoxy among some who study climate issues is that, despite their rhetoric, religious leaders haven't done much to energize voters. NPR recently reported on IPL's efforts but raised doubts about religion's clout. The report cited a Pew survey conducted in 2010 in which only 6 percent of respondents said religion's influence was most important in shaping their opinions on environmental protection. But Randolph Haluza-DeLay, a sociologist at King's University College in Alberta, dismissed the Pew study, saying he believes IPL works "on the ground level," where it is more likely to have an impact. He said it has the potential to "have a lot of influence." But whether it does, or doesn't, he added, is hard to measure. Bingham bristled when asked about the skepticism that often surrounds her cause: "If I thought there wasn't hope in mobilizing the religious community, I certainly wouldn't have dedicated my life to the effort," she said. "We do our level best to express to people that this is not about politics." But Bingham has nothing against making surprising political moves herself. Working with Sen. Pavley in California during the 2002 campaign to regulate vehicle greenhouse gas emissions, she persuaded pastors from around the state to preach about air pollution. When Bingham discovered that an Assembly member who was undecided about the bill was a regular churchgoer, she made a phone call to the member's pastor. A few months after A.B. 1493 had passed, the Assembly member -- who had voted in favor of the bill -- approached Pavley. "He said, 'I don't know how you did it, but how did you get my priest to come visit me one on one in my house?'" Pavley recalled. "Sally Bingham's efforts helped to secure the passage of that bill." In 2006, Bingham again rallied the support of faith communities to help pass the Global Warming Solutions Act, aimed at reducing California's emissions to 1990 levels by 2020. Word of Bingham's efforts reached the top, and she found herself standing next to Gov. Arnold Schwarzenegger when he signed the act into law. Bingham has won an armload of environmental prizes, including the Audubon Society's 2012 Rachel Carson Award. She has also brought a singular perspective to the environmental movement. "We have many scientists, business leaders and experts on our board, but Sally infuses each discussion with the moral dimension of the question at hand," the Environmental Defense Fund's president, Fred Krupp, said in an email. "She reminds us of the real human lives involved in our decisions. ... More than a few times, a vigorous debate has pivoted on Sally's words, as she reminds us of what's really at stake." The United States is one of the most religious among the world's developed nations, and Bingham says she won't be satisfied until all 350,000 or so American congregations consider "stewardship of the environment as a matter of faith." Earlier this month, Light Street Presbyterian Church in Baltimore participated in IPL's "National Preach In on Global Warming". It joined the linkage of churches across the nation to devote an entire service to environmental issues. Speaking to the diverse group of elderly couples, twentysomethings and young families gathered in the pews, the Rev. Roger Scott Powers delivered a sermon that could have come from Bingham's own mouth. He gravely reminded his flock of recent extreme weather events, saying, "We no longer have to wait 100 years to see the catastrophic effects of climate change." "Climate change is a moral issue," the pastor concluded, "and the religious community needs to lead the way."